Santana's band roster reads like a who's who of stellar musicians, from the original six (Michael Shrieve, Gregg Rolie, et al) to the current lineup, including dynamic percussion duo Karl Perazzo and Raul Rekow. One of the latest additions on tour is drumming phenom Cindy Blackman. Born in 1959, Blackman comes by her talent naturally; her mother and grandmother were classical musicians; her uncle plays vibes. While her maternal side steeped her in classical music, her father introduced her to her life-long love: jazz. 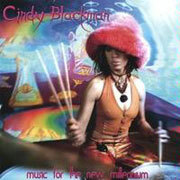 Cindy Blackman drum solo shows her jazz chops and dynamic performing style. Siting such luminaries as Tony Williams, Art Blakey and Jack DeJohnette as influences, Cindy has dedicated herself to excellence in one of the most challenging of musical genres. "To me, jazz is the highest form of music that you can play because of the creative requirements," she explains. She attended the Berklee College of Music for three semesters, during which she studied with renowned teacher Alan Dawson. Blackman left school to move to New York, where, in addition to gigs with The Drifters and other bands, she honed her chops performing on the streets of the city. It was also an opportunity to see a number of jazz drummers live. Cindy says of her relationship with Art Blakely: "He really was like a father to me. I learned a lot just watching him. I asked him a lot of questions about the drums and music — and he answered all of them. He was fantastic." 1993 brought a call from retro rock icon Lenny Kravitz, who asked Blackman to fly to Los Angeles. Beating out dozens of other players, Cindy scored the coveted spot as Lenny's drummer, a job she held for 11 years. Although an experienced player, she was new to the world of arena rock, and it took time to adjust. "The first time I played in a really large concert with Lenny was at an outdoor festival . . . for 70,000 people . . . I almost lost it, my equilibrium was teetering. I wasn't used to seeing that many people; I was disoriented; I just had to stop looking and start focusing." She also showed that although she was a skilled jazz drummer, she could play, and maintain, a solid rock groove — something many technically proficient players have difficulty mastering. By 2004, Blackman had left the Kravitz gig and returned to her first love: jazz. By now an accomplished composer, she recorded a number of albums of her own, in addition to playing jazz in small clubs, conducting drum clinics around the world, and releasing her own drum teaching video called Multplicity. While on tour with Carlos Santana (who was also Blackman's boyfriend) in July 2010, Cindy received a proposal -- on stage -- from the Latin rock legend. She accepted, and the two are engaged.